This July, the rulers of the twenty most powerful nations in the world—the G20—will meet in Hamburg to coordinate the preservation of capitalism and state power at the expense of the natural world and the freedom and dignity of humanity as a whole. Anarchists and other foes of tyranny will be in Hamburg, as well, to demonstrate the kind of assertive resistance it will take to put control of our destinies back in our hands. For your convenience, we have prepared an overview of the actions that are planned in Hamburg, and a variety of resources on the mobilizations against previous G8 and G20 summits. In addition, this week we will publish retrospectives on the demonstrations that took place in Scotland and Germany against the G8 summits of 2005 and 2007. Historically, anarchists have utilized the summits of the WTO, IMF, G8, and G20 as opportunities to dramatize our opposition to the hierarchical bureaucracies that govern our world, in hopes of inspiring ever wider resistance. Be it G7, G8, G20, or G1000, any system that empowers heads of state and their lackeys to decide the fate of billions is fundamentally exclusive and coercive. We oppose the G20 summits because we believe that only horizontal grassroots initiatives can solve the problems facing humanity. Financial crisis, climate chaos, ethnic violence, and state repression are the necessary consequences of markets and governments that concentrate power in the hands of the most ruthless few. When everyone is forced to compete for resources and power rather than being free to develop ways of life based on sharing and peaceful coexistence, no one wins, not even the 20 most powerful people on earth. The German government intends to hold the 2017 G20 summit in a famously rebellious part of Hamburg, the St. Pauli / Karoviertel / Sternschanze area. It is difficult to understand this decision except perhaps as further evidence that today, no one in any position on the political spectrum has any idea what to do about the conflicts of our time except to continue blindly escalating. This event will position nationalist authoritarians like Trump, Erdogan, and Putin alongside neoliberals like Merkel and Macron against the rank and file of humanity. Previous G20 summits have seen inspiring and confrontational forms of resistance and appalling violence from the state—for example, at the 2001 G8 Summit in Genoa, at which police murdered Carlo Giuliani and permanently injured many other people. The way things have been going, we can only expect resistance and repression to escalate in Hamburg. Already, railway sabotage has caused massive delays around Germany, with a communiqué on German indymedia claiming credit. Consult this guide for context about police tactics in Germany and how to counter them. The liberal demonstration involving Greenpeace, Oxfam, and other NGOs is taking place days ahead of the summit, underscoring organizers’ desire to avoid any real conflict with the authorities (and anyone else). Considering that they are simply demanding that the G20 make capitalism “equitable” and “sustainable,” to “fight tax evasion” and “strengthen parliaments,” it is hardly surprising that they have no plans to do anything that could lend force to these watered-down requests. Today, liberal moderation is less realistic than the most maximalist anarchist program: it is not hard to imagine that capitalism could crash and burn, but no one has any idea how to restore social democracy. The group Allesallen is announcing some sort of street theater under the title “1000 Forms” to be followed by some kind of dance. Vandana Shiva and others invite you to a series of panel discussions and workshops in which “scientists, activists, and politicians” will propose their alternatives to the current order. If only changing the world were simply a matter of discussion! This is an open call for a massive black bloc demonstration rejecting capitalism and the state in their entirety. A call for students to walk out of their schools and universities and join others in shutting down the harbor, blockading the G8 summit, and reclaiming the “red zone” in the center of the city. A mass demonstration including a black bloc and a Kurdish bloc, organized by the left-wing party Die Linke and others. NoG20 2017: The most comprehensive overview of events. NoG20 Climate Campaign: Activists already carried out an effective blockade of the harbor in Hamburg. Shutdown Hamburg: The effort from the libertarian communist group ums Ganze! and Beyond Europe. G20 Entern: A largely Leninist communist group, which nonetheless included anarchist banners in their video, with the mysterious consequence that the video was shared by a North American anarchist group, SubMedia. Anticapitalist Camp: As of this writing, the anti-capitalist camp has not yet secured a space for visiting demonstrators to sleep; however, the more liberal camp has. The next summit of the world‘s 20 economically and politically most powerful countries is supposed to take place on 7 and 8 July 2017 in Hamburg. The envisaged venues are the exhibition halls in Hamburg’s inner city in the residential quarter St. Pauli. There will be thousands of delegation members and journalists accompanying and an army of police, secret service and the military protecting the world’s rulers. The integration of international unions and NGOs is sustaining the claim to take far-reaching decisions. Externally, the German organisers are practising social window-dressing, landmark themes are supposed to be women, flight and health. This is a populist smoke screen; fundamentally, G20 is focusing on the distribution of geo-political interest spheres and power claims and on the co-ordination of world-wide exploitation. G20 is not a meeting representing the majority of humankind, but an assembly of bourgeois governments, torture states and warring military blocks reinforcing global exploitation. Host country Germany is – besides China – one of globalisation’s winners of the past 25 years. Therefore, July 2017 G20’s motto should be “Be a Guest of Winners”. Hamburg and its harbour as an alleged “Gateway to the World” are unconcerned by the blood trails of international exploitation dripping from its walls. This summit makes for a world order responsible for several military conflicts, wide-spread poverty and the death of more and more people during flight and migration. Since the 2008 financial crisis, the global capitalist regime has changed directions: globalisation, i.e. exchange of commodities, networks of production relations and the extent of multinational companies’ trans-national investments are waning. Conclusion of international free-trade treaties has come to a halt, world-wide trade agreements had been given up before that. This is coinciding with growth rates cut in half on a global scale. Before the financial crisis, the majority of capitalist core countries has benefited from globalisation’s growth push – albeit distributed unequally. Since the financial crisis, resource-exporting newly industrialising countries (Brazil, Russia and South Africa, among others) in particular, but as well First World countries displaying huge trade deficits and substantially contracted industrial production (like England, Italy, Greece etc.) are targeted by political and economic crises. In these circumstances, there are but few economic competition strategies promising success, for instance the retreat to a huge internal market, like the US or China, or a massive increase of exports to the detriment of other countries’ industries, as in Germany, the Netherlands or Sweden. These strategies are supposed to be safeguarded by trade agreements like CETA and TTIP. Countries suffering the inaccessibility of these options, but expected to continue functioning as markets, are led to reactions like protectionism and – wherever possible – devaluation of currencies in order to offer their commodities at lower prices in the world market. Unity among capitalist core countries is going to become more fragile, balance between G20 countries is declining substantially. In the Tricont’s (Global South) world-wide poverty regions, economic defence measures are not available. Mass impoverishment and social isolation and oppression turn – like during the Arabian Spring – into regional riots or religiously disguised repression of Islamic movements. Likewise, local ruling circles don’t cease to aggravate exploitation and the police state’s access. If this doesn’t bring about pacification, repression turns into long-lasting civil wars. “Regime Change” is over – the old G7/G8 concept has failed. The West doesn’t continue attempting to smother rebellions via Western military inventions or to abolish insubordinate regimes in order to establish a new order like in Afghanistan, Iraq or Libya. Conflicts are relinquished to local agents (e.g. the Saudi Arabian intervention to tackle the civil war in Yemen) or otherwise controlled using more informal interventions (like in Iraq and Syria). Greater emphasis is placed on a “Gated Capitalism” focusing on the residual islands of growth while the poor and the oppressed are drowning and perishing beyond its coasts and fences. As the promises of growth and prosperity cannot be fulfilled any more even in the Metropolises, which causes modification of the state and society’s regulation framework, right-wing populism, militant nationalism and authoritarian paradigms are thriving in Europe, the US and Asia. Economic-political protectionism as well as the eviction of migrants including the construction of border fences are called for. Internally, anything not fitting the norm, anything queer or just non-conformist is under suspicion. This analysis mustn’t be read as an economicised deduction from impoverishment theory. While recently successful populist parties are primarily being supported by lower-class white men, these movements are simultaneously flourishing in the prosperous and economically victorious states of the European North and East as well. Frequently, this racism has developed over generations and is lacking any actual object or reference point like a substantial number of refugees in the country or imminent job loss. We are opposing the Right-Wing Populist International: from the Hungarian Orban regime’s xenophobic lockdown policy, racially-motivated Brexit, the racist world view of Germany’s AfD or Front National in France, the Islamist nationalism of the Turkish AKP regime to chauvinist Donald Trump’s election victory. War and capitalism are inseparable. From a historical perspective, war has been part of capitalist crisis management strategies again and again. For decades, Cold War’s status quo had suspended this logic between Eastern and Western industrial nations temporarily and transferred conflicts as proxy wars into the Tricont. After the Eastern Bloc’s breakdown, new windows of opportunity have opened for capitalist crisis and war logic. The neo-liberal regime since 1989 has created new global strategies to open up new markets and secure resources for the leading industrial nations. To secure their spheres of power and influence, the capitalist core countries‘ governments are falling back on military options more and more frequently. Contradictions and competition aren’t going to be negotiated any more by the implementation of trade agreements and a capital-oriented customs and fiscal policy combined with the respective currency and credit policy, but result in military escalation more often than before. The direct or indirect involvement of nearly all G20 states into recent warlike conflicts is no coincidence. No matter if there are proxy wars, alleged police operations or “peace-keeping” military measures – all of these are just different labels for death and destruction. Merely military conflicts between leading core countries of political power are being forestalled – yet. That this is not forever is indicated by the increasing escalation between NATO and Russia. The Russian regime is dealing with the aggressive NATO Eastern expansion via massive rearmament threatening ex-Soviet republics having joined NATO and EU. Due to capitalist competition dynamics and economic sanctions, Russia is facing serious economic problems. The Ukrainian war taking place within the framework of capitalist competition logic between the EU and Russia reflects the struggle for power, spheres of influence and markets. The murderous war in Syria serves as an example for there being no alternative to capitalist war logic. From a Russian perspective, the assertion of their dwindling influence in the newly structured Near East after the Arabian Spring is at stake. The US and EU see the Syria conflict as part of the war against Islamist movements on the one hand and a means to stabilise their power base and fight rival Russia on the other. Regional power Turkey is taking advantage of the situation to fight the Kurdish movement as well as the Islamist and Laizist opposition but also to reinforce regional-politic claims via military interventions in Syria. A solution to the original conflict and putting not only an end to dying but also bringing about a perspective of peace to the people in Syria don’t feature in any of the political powers‘ considerations whatsoever. Death and displacement of ten thousands of people are being accepted deliberately. In the mid-1970s, the post-World War II capitalist sociation model became subject to crisis. This development encouraged the triumph of a neo-liberal model of economy and society relying on de-regulation of markets and a policy of privatisation even of essential public services and the educational sector and attempted to capture people with empty promises of wealth and prosperity. This soap bubble of a virtually co-operative world government and a common world-wide policy of internal affairs as a supposed strategy of peace-keeping was actually inextricably connected with external and internal rearmament. Ideologically, this has been accompanied by the enforcement of militarisation as an option of political action. The formation of the EU as a militarised political power has to be considered within this context. As a protagonist representing the interests of European core states under the leadership of hegemonic power Germany, since about 2000 the EU has been enabled to intervene militarily all over the world. Wars have been and are still shaping the reinforcement of neo-liberal strategies for the last 25 years. The reasons for the destruction of ex-Yugoslavia, de-stabilisation of the former Soviet Union and various conflicts on the African continent are to be found in the conquest for and aggressive safeguarding of markets and the exploitation of resources. The world-wide scope of this militarised policy is covering “low intensity warfare” conflicts, civil wars and open military inventions. A common consequence of all of these is the destruction of old systems of societies and economies resisting the neo-liberal claim to omnipotence. Frequently, flight is the only alternative for people affected by this policy. De-stabilisation strategies are resulting in reactionary counter-movements challenging Western capitalist interests. Military conflicts are a logical consequence resulting from capitalist core countries’ own economic and expansion policy. Islamist terrorism and consequent flight movements are essentially developing from this de-stabilisation policy forcing societies into a permanent status of war. Militarisation of external political action is resulting in internal militarisation as well and is therefore bringing about change of Western societies. An acceptance of repressive solutions to social and economic conflicts involving police or even military forces is increasing. Escalation as a consequence of hegemonic policy of external affairs is turning into an argument in favour of internal rearmament. The reinforcement of society’s internal contradictions is reflecting the aggravation of external policy. Impoverishment and an increasing gulf between the poor and the rich are not supposed to be alleviated by full employment and promises of prosperity any more, but to be managed internally and rendered controllable via repressive counter-insurgency policy. Simultaneously, neo-liberal globalisation is being replaced by a new stage of the world-wide capitalist system’s strategic re-organisation. External de-integration of globalisation’s idea of a common market is represented by crisis management following economic crisis. This break-up is resulting in nationalism, protectionism and the development of an increased willingness for confrontation even among hegemonic capitalist core states. War is their policy, competition and exploitation are their perspectives. Values like peace, human rights, economic justice and a responsible use of the world’s resouces are seen merely as obstacles to the free development of capitalist expolitation interests. When the representatives of the prevailing (dis)order are going to display spectacular images of themselves in Hamburg, we will be confronting them with our actions of trans- and international resistance and our idea of a world worth living in! Since the end-1990s, similar rulers‘ summits couldn’t be executed without us and without disturbance. Seattle, Genua, Göteborg and Prague won’t be remembered as successful summits, but as strong moments of anti-capitalist resistance. As they had to take our coming to their summits into account, the following years‘ G7/G8 summits in Europe have been re-located outside bigger cities due to our protest and action. Rather, meetings have been re-arranged to take place in luxury resorts, as far as possible from urban infrastructure to keep protests at bay. Right now, another great summit of heads of states and governments is going to take place in a European city in Germany. As radical and anti-capitalist left, it’s going to be our duty to confront this spectacle of power in Hamburg together with many other people and to put forward our ideas of a more just and solidary society. The 2000s‘ summit mobilisations have been precious moments of meeting and co-operation of left-wing and anti-capitalist groups and networks from all over Europe and world-wide. We have been sharing experiences and fighting together, attending international meetings, being attacked by cops supported by the military, re-organising our forces and fighting back. Anti-globalisation movement has changed, but our networks endure. We are active locally in our regions, cities, villages and forests. But we are also fighting trans-nationally. We have been meeting again and again – in Rostock/Heiligendamm, Strasbourg, Athens, Copenhagen, the German Wendland region, Paris, Milan and Frankfurt. During the last years, we have been networking trans-nationally in many different ways: we have been solidarily resisting EU austerity policy, in Greece in particular, but also in Spain, Portugal, Ireland or France. While primarily local movements have been staging disobedient square squattings, strikes, demonstrations, expropriations and squattings of buildings, exchange and mutual learning have gained power and continuity. In particular, no-border camps‘ actions aiming at refugee camps and routes did display an internationalist and trans-national character. We didn’t succeed in everything (by far), but looking for trans-national perspective, action and organisation has become a matter of course, at least in Europe. This understanding of internationalism is as heterogenous and plural as the movements acting therein. Nobody is merely the victim of prevailing conditions, if we are resisting in a collective and self-empowered way. The upcoming Hamburg summit is representing symbolically and practically much that we despise on a fundamental level. Character masks are exchangeable, but they are real. Our scheduled actions will state our struggle against their policy of war, terror and exploitation unambigously! We are going for a symbolic and practical break with the prevailing order – together with many activists from all over Europe. We are disrupting and obstructing the smooth operation of the summit’s performance in Hamburg. We are opening and utilising room for taking up manifold, unpredictable mass action against the G20 summit. Obviously, thousands of military, police and secret service forces will be protecting this spectacle. Displaying typical arrogance of power, all of this is going to take place in the densely-populated inner-city quarters of Hamburg, just a stone’s throw from Rote Flora and several other left-wing social centres. People just have to leave their houses to enter the red zone or to join an action. For 15 years, Hamburg’s radical left has been fighting against capitalist urban development and for a „Right to the City“. Our urban-political struggle cannot only be traced back to 1970s squattings or the successful fight for St Pauli Hafenstrasse or Rote Flora. We have connected these fights with resistance against job precarisation and increasing rents, for the freedom of squatted mobile home parks like Bambule, together with refugee movement Lampedusa in Hamburg or against extensive danger zones for riot control. We have gained these experiences, they are alive and we will access them. And we will access urban areas during the summit as well. Repression won’t be able to prevent this if we are many and if we are unpredictable. There will be no quiet hinterland. 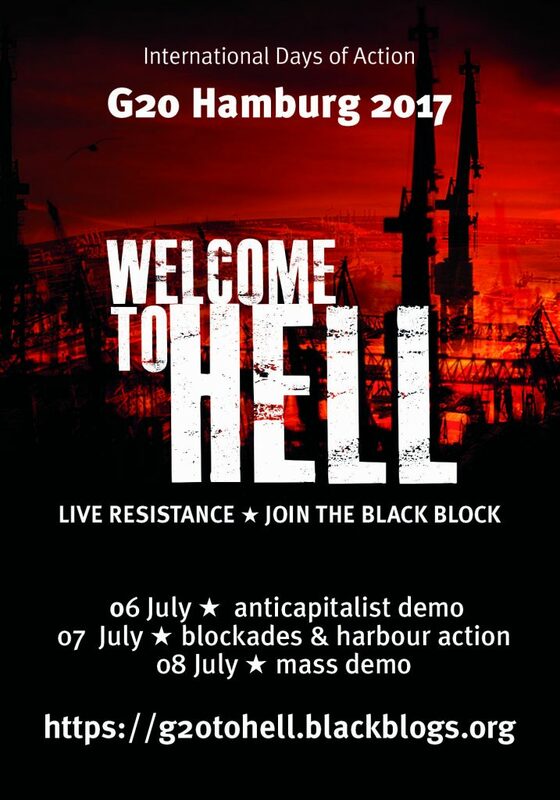 This is an invitation to our comrades, companions and friends from all over the world: Come to Hamburg in July 2017 and join the resistance against the G20 summit! The radical left has confronted the rulers in many fights: we are still manifold, solidary and unpredictable. Our social centres, particularly those in the summit’s vicinity, will be access points for exchange and the formation of resistance. Quite contrary to mainstream bourgeois opposition, we won’t suggest alternatives to the powerful in order to keep the capitalist system alive. Our solidarity is with all emancipatory movements joining the resistance in the streets against the Hamburg summit. And we will decide for ourselves which forms of action are politically adequate and communicable. *AND DURING ALL THIS TIME: RESISTANCE AGAINST THE SUMMIT AS SUCH! OBSTRUCT, DISRUPT, DISSECT G20 SUMMIT! This entry was posted in News blog and tagged anarchism, germany, insurrection. Bookmark the permalink.